The Supreme Leader has said that Iran will continue to support the Iraqi government and people and back unity among Iraqi revolutionary groups and fighters. Leader of Islamic Revolution Ayatollah Seyyed Ali Khamenei says the West seeks to undermine the unity of Iraq. Ayatollah Khamenei made the remarks in a meeting with visiting Iraqi Prime Minister Haider al-Abadi on Wednesday. The Western intelligence agencies aim to destroy the pillars of Iraq’s political and national unity, Ayatollah Khamenei pointed out, adding, “One should vigilantly and carefully stand against this plot and divisive attempt and not allow the unity among the Shiites and Sunnis and Kurds and Arabs to be damaged,” the Leader added. The Leader highlighted Iraq’s battle against terrorists in the country, saying the resistance by the Iraqi nation and government will also provide security for regional countries. The Leader hailed the contribution of the popular volunteer forces to the campaign against terrorists in Iraq, stressing that the units can also play “an effective and influential role” in the progress and future of the country beyond the battlefields. Ayatollah Khamenei further said that the ill-wishers of the Iraqi nation are against the “emergence of a massive popular force” in the country and urged the Iraqi people and officials to exercise vigilance about the divisive plots of foreigners. “The Americans on the one hand are seeking to plunder Iraq’s wealth as they do in some other Arab countries in the region and on the other hand impose their demands [on Iraq] as before. However, one should not allow this objective to be realized,” Ayatollah Khamenei said. The Leader said Iran will continue to support the Iraqi government and people and back unity among Iraqi revolutionary groups and fighters. 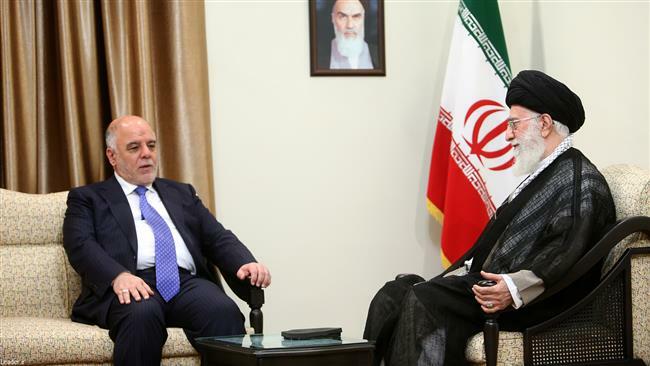 The Iraqi premier, for his part, praised Iran’s backing for his country in the fight against terrorism and said Tehran’s unwavering support and its friendly cooperation with Baghdad are indicative of the depth of the relations between the two nations.